Micolindun GM-20 headset is the ideal headset for gamers looking for lightweight comfort, superior sound quality and added convenience. Its 50mm directional drivers position sound directly into the ear for audio precision and gaming-grade sound quality. 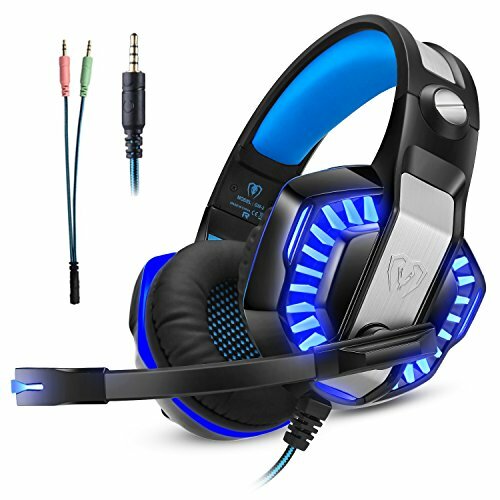 1.【High Compatibility】This gaming headset with Y splitter perfectly match with your PS4, New Xbox One, Nintendo Switch/3DS, PSP, Smartphone, tablet, laptop, etc. 2.【Practical Design】In-line microphone, adjustable angle; Stretchable headband, no worry about size; Braided wire, durable tensile effectively reduce the external resistance and lightweight design is more comfortable for long time wear. 3.【Cool Breathing Light】Brilliant LED lighting effects, enhancing the atmosphere of games. 4.【Especially Convenient】Plug & play, no driver needed, 3.5mm plugs for mic and headset + USB plug for lights , more to ensure the stability of the sound. 【Excellent Compatibility】Plug &play, no driver needed. Support PlayStation 4, New Xbox One, PC, Nintendo Switch/3DS, Laptop, PSP, Tablet, iPad, Mobile Phone. Please note you need an extra Microsoft Adapter (Not Included) when connect with an old version Xbox One controller. The adjustable steel slider can be adjusted for different head size, suitable for men, women and childern. 【Fashionable&Durable Design】Both the headband and earmuff combine fashionable metallic elements, which make the headset better to touch and more durable. Braided cable of 2.10m, beautiful and durable, not easy to tangle. Brilliant LED lighting effects, enhancing the atmosphere of games. 【Upgraded Microphone】The most advanced soft omnidirectional microphone, can be fixed at any angle, and can also be folded up when not using it. Contrary to traditional hard microphone, the upgraded microhpone could enhance the collection of sound to a great extent and ensure the quality of online communication. 【High Quality Sound】 High precision 50mm magnetic neodymium driver, advanced ambient noise isolation technology, bringing you vivid acoustic experience, clear sound quality, shocking bass effect, perfect for immersing yourself in the gaming world. 【Ergonomic Design】Superior comfortable over-ear pads with good air permeability, high-quality signature memory foam, muti-points headband, no pressure for your head, for ultimate comfort in prolonged gaming sessions. Wire control is attached to the braided cable at you left hand, 45cm away from the headset，convinient to control the volume and close the microphone. If you have any questions about this product by Micolindun, contact us by completing and submitting the form below. If you are looking for a specif part number, please include it with your message.